Containment Protocols: The wildlife reserve in which RPC-030-A is located is classified as a restricted area; joint operations have been arranged with the local park ranger to keep any unauthorized personnel from entering OL-Site-556. All roads leading to RPC-030-A have been unpaved and planted with the indigenous flora. Any supplies going to OL-Site-556 must be delivered biweekly by the Authority's VTOL Mk. I to avoid creating convoy trails into the reserve. The entirety of RPC-030-A must be hermetically sealed with at least 2 buffer zones. Inspection for any possible leakages is to be undertaken at 05:00 local time every day. Maintaining personnel must wear the proper HAZMAT suits and undergo the standard decontamination protocol when exiting RPC-030-A. Any personnel that has been exposed to RPC-030-B is to be held in a quarantine chamber for at least 2 weeks with no exposure to sunlight. If symptoms manifest before the 2 week period, exposed personnel are to be terminated and their corpse disposed of through cremation. All instances of RPC-030-C must be sufficiently dismembered until it no longer exhibits motor functions before being taken to the crematory. Description: RPC-030-A is a solutional cave located in the ████████ Wildlife Reserve, ██, USA. RPC-030-A roughly burrows 300 meters underground and features several stalactites along the mouth of the cave. RPC-030-B is a naturally occurring pure water vapor (H2O) propagating from crevices around the interior of RPC-030-A. The temperatures of RPC-030-B can reach up to 86oC. RPC-030-C is the designation for any human that is exposed to RPC-030-B and has reached Stage 3 of Scenario 2. Through geological analysis, RPC-030-A itself does not exhibit any anomalous properties. However, RPC-030-B causes living organisms to mutate and/or deform. The anomalous properties of RPC-030-B only manifest when it makes contact with living tissue of Homo sapiens; the biohazardous nature of RPC-030-B does not affect unintelligent life. Stage 1, 1-5 minutes Subject will exhibit light skin rashes around their bodies, accompanied with a sore and/or itchy throat. Subject will announce slight discomfort. Chances of survival: 93%. Stage 2, 5-7 minutes The rash progresses to Cutaneous Leishmaniasis-like scars1, along with Hemoptysis.2 Subject will announce pain. Chances of survival: 47%. Stage 3, 7-18 minutes Severe cases of Necrotizing Fasciitis3 throughout the subject's body. Usually, this stage is considered as the death offset; no subject has ever survived Stage 3 of Scenario 1. Stage 4, 18-n minutes At this stage, the Necrotizing Fasciitis would have consumed 90% of the subject's tissue. The time it takes to reach a total loss of flesh depends on the subject's weight. The Cutaneous Leishmaniasis-like scars manifesting in surviving subjects of Stage 2. Gangrenous limb surgically removed from CSD-90612-002 after 15 minutes of exposure. Stage 2, 7-12 minutes Abnormal growth of flesh caused by various types of both bone and tissue tumors manifests around the subject's body. Subjects will usually start to speak in an erratic manner. Chances of survival: 8%. Stage 3, 12-19 minutes Continued progression of connective tissue neoplasms. At this point, all subject's brain activity has ceased. However, subjects are still capable of performing basic motor functions. 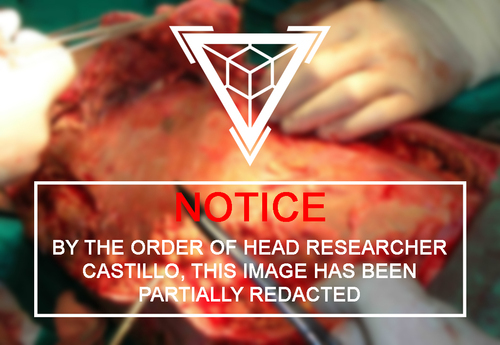 Subjects that are exposed to Stage 3 of Scenario 2 are hereby classified as RPC-030-C. Stage 4, 19-26 minutes RPC-030-C will regain the primitive part of its brain functions; actively hunting other lifeforms to consume. RPC-030-C instances may utilize its bone protrusions as weapons. Stage 5, 29-40 days RPC-030-C instances will start to decay due to extensive Necrosis5. Stage 6, 40-n days Complete cessation of motor functions on RPC-030-C instances. Residual flesh does not exhibit any extranormal properties. Post-mortem autopsy of an RPC-030-C instance, showing the chest cavity. Specific wavelengths of 367 nanometers (UV light) accelerates the time needed to reach the different stages of exposure. Extensive research has concluded that direct sunlight will have roughly 38.7% of accelerated expiration offset. Researchers are unsure on the cause of differing scenarios as the chances of an exposed subject undergoing either scenario are completely random, regardless of age, gender or health. It is unknown whether traces of RPC-030-B that has risen to the atmosphere prior to containment had condensed and mixed with rainwater or had just simply diffused and lost its anomalous properties. RPC-030-A was first discovered in ██/██/1999 due to reports of a deformed humanoid wandering the outskirts of the ████████ town prompted local authorities to investigate. The deformed humanoid—later identified as an instance of RPC-030-C—had been consuming farm animals in the town of █████. The instance of RPC-030-C was later discovered as a hiker by the name of ████ ██████ that went missing 4 months prior to the first sighting. A joint investigation by MST Sierra-8 "Sundowners" and the local police department launched shortly after the sighting. The Authority was able to find RPC-030-A by discovering man-made refuse around the mouth of RPC-030-A. 12 Authority personnel was exposed while establishing OL-Site-556. MST X-Ray-6 "Annulifiers" was later assigned to amnesticize the local population immediately after the investigation was concluded in ██/██/1999. On ██/██/████, during the secure testing session of Nucorp Industries' "Hiemabellum" Program, 56 personnel was exposed to a weaponized sample of RPC-030-B due to containment failure. Out of all exposed personnel, 13 of which has progressed into augmented instances of RPC-030-C. Fortunately, security personnel successfully terminated the RPC-030-C instances before additional personnel fell victim. The exposed personnel was later put into quarantine in accordance with the RPC-030 containment protocols. None of the quarantined personnel developed lethal symptoms. However, 3 cases of murder were reported due to internal conflict among the exposed personnel. MST Sierra-8 "Sundowners" investigators along with its coroner team reported that the effects of RPC-030-B did not factor into the murders. Dr. ██ ██████, supervisor of Nucorp Industries' "Hiemabellum" Program reported an extraordinary result of the weaponized RPC-030-B samples. However, Global Director 03 proposed to restrict Nucorp personnel to work on RPC-030 and on ██/██/████, the Board of Global Directors unanimously agreed to terminate the RPC-030 weaponization program. 1. 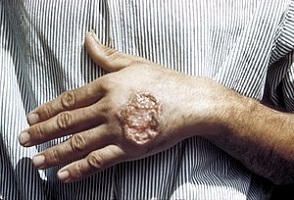 Severe skin ulcers caused by a parasite of the genus Leishmania. Although in this case, no traces of Leishmania are found on subject's body. 3. Commonly known as a symptom of a flesh-eating disease. 5. Death of cells in living tissues.